Try to ensure each member of the family is eating a minimum of 2 servings of fruit and 3 vegetable servings each day. Servings - What does a serving look like? 2 smaller fruits such as satsumas, plums or kiwi fruit. 3 apricots, 6 or 7 lychees or 14 cherries. 1 handful of grapes or berries. 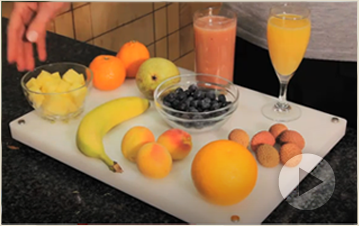 1 medium fruit such as a banana, an apple, an orange, a pear or sharon fruit. Half a large fruit such as a grapefruit or 1 large section of papaya, 1 slice of melon (5cm slice), 1 large slice of pineapple. 2-3 tablespoons of fresh fruit salad. 2-3 tablespoons of tinned fruit such as peaches or pineapple. Children can also be encouraged to eat at least 5 servings of a variety of fruit and vegetables each day. However, the serving size a child needs varies with age, body size and physical activity. As a rough guide, 1 serving is the amount they can fit in the palm of their hand. Green vegetables - 2 broccoli spears or 4 heaped tablespoons of kale, spinach, spring greens or green beans. Cooked vegetables - 3 heaped tablespoons of cooked carrots, peas or sweet corn, or 8 cauliflower florets. Salad vegetables - 3 sticks of celery, a 5cm piece of cucumber, 1 medium tomato or 7 cherry tomatoes. Tinned and frozen vegetables - roughly the same quantity as a fresh serving. For example, 3 heaped tablespoons of tinned or frozen carrots, peas or sweet corn. What’s a serving of juice? One 150ml glass of unsweetened 100% fruit or vegetable juice can count as a serving; but only 1 glass counts — further glasses of juice don’t count toward your total 5 A DAY servings. One smoothie containing all the edible pulped fruit or vegetable may count as more than one of your 5 A DAY servings, but this depends on the quantity of fruits or vegetables and/or juice used, as well as how the smoothie has been made. At least 80g of one variety of whole fruit and/or vegetable and at least 80g of another variety of whole fruit and/or vegetable. Smoothies count as a maximum of 2 of your 5 A DAY, however much you drink. Omelette with sliced red onion, spring onion, mushroom or tomato. Grilled tomato and large mushrooms with poached egg and beans. Kippers and grilled tomato wedges. Baked Potato with homemade coleslaw or topped with cauliflower cheese. Salad Hummus Wraps (with lettuce, tomato, cucumber, scallion). Baked potato with broccoli and cheese. Order vegetarian sandwiches and wraps. They are usually low in calories and can pack in two servings of vegetables. Soups are a great way to hide lots of vegetables. Butternut squash, tomato, leek and potato, they are all nutritious soups that if blitzed down, won't have lumps of vegetables for anyone to protest over! A great way to cunningly hide vegetables is in pasta sauce. Enjoy a cheese sauce mixed with steamed, pureed broccoli or cauliflower. Add vegetable power to family favourites. Try increasing the vegetable content of family favourites such as spaghetti bolognaise or shepherd's pie by finely chopping or grating vegetables like carrots, courgettes, swede or peppers into them. Instead of using plain potatoes for the cottage pie topping, try using a mixture of sweet potatoes, potatoes and parsnips instead. You can make in large batches and freeze in small portions. Pizzas are a fun way to get kids to experiment with new tastes. Use mini wholemeal muffins cut in half as the base! Chop up a bunch of different vegetable toppings. Children love making their own pizza and will be more willing to try out the vegetables on it because they put them there themselves! Family roasts on a weekend are a great way to get everyone round the table together. Delicious roast chicken with roast wedges or chips of potato, parsnip, carrot or butternut squash are a great way to get the little ones to eat more vegetables as they look like chips. A lean meat such as beef, lamb or pork steak, a serving of potato and an 80g serving of two different vegetables such as carrots and broccoli. Chilli con carne (80g carrots, 40g of onion and 40g of tomato per person). Vegetable sticks with hummus: You can buy mini tubs of hummus, or simply make your own and serve it with sticks of carrot, cucumber, celery and peppers. Pack sliced carrots and celery with your lunch for a nutritious afternoon snack. Crunch on a few sugar snap peas for a power snack.